A 19th century artist and his beautiful model; a young girl raised in India and sent to an English boarding school; a writer who takes her children to the countryside during World War II; and a 1920s biographer researching his latest work. These are just some of the characters whose stories are told in The Clockmaker’s Daughter and tied together by a present day archivist, Elodie Winslow, who is trying to make sense of it all. At the beginning of the novel, in 2017, Elodie comes across two intriguing items in the archives of a man called James Stratton. One is an old photograph showing a woman dressed in Victorian clothing; the other is a sketchbook with a drawing of a house near the bend of a river. Elodie feels that the house looks familiar somehow…but where could she have seen it before? And who is the woman in the photograph? To find the answers to these questions, we have to go back to the summer of 1862 when a group of young artists known as ‘the Magenta Brotherhood’ are gathering at Birchwood Manor, the home of the talented painter Edward Radcliffe. By the end of their stay, a woman has been killed, another has vanished without trace and a valuable jewel has disappeared. We know that these incidents must be linked in some way to the photograph and sketch that Elodie has found, but before we can fully understand their significance we must follow the stories of all the characters I mentioned above – and several more. 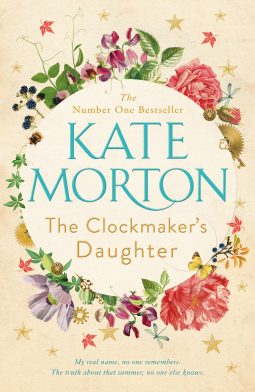 The Clockmaker’s Daughter is a complex novel and, I have to admit, I would have preferred it to have been a bit less complex! There were far too many different strands to the story and I struggled to keep track of what was happening and how the various characters were related to each other. New characters, often seemingly unconnected to any of the others, were still being introduced well into the second half of the book and it wasn’t always very clear how they were going to fit into the sequence of events. It all makes sense in the end, but I’m not sure it was really necessary for things to be so confusing. Although I would have preferred a more straightforward, linear structure, I still found a lot to like about this book: there’s a supernatural element which I thought was used very effectively; I loved Birdie Bell, the eponymous clockmaker’s daughter; and I really enjoyed the last few chapters, in which we finally discover what really happened that summer in 1862. To compare it with the other two Kate Morton novels I’ve read, I thought this one was better than The Distant Hours but not as good as The Forgotten Garden. I’m not sure whether I will be reading any more of her books, although I could probably be tempted. Thanks to Pan Macmillan for providing a copy of this book for review via NetGalley. There were a lot of intriguing ideas and characters in this book, but as a whole it was just a bit too disjointed for me. You might enjoy it more than I did, though! I just finished reading this one, and I liked the diverse strands of it. This was one of Morton’s best, although I still prefer one of her earlier novels. It sounds as though you liked it better than I did, then! The Forgotten Garden is my favourite of the three that I’ve read by Morton. Yes, that’s the one. I kept wanted to call it The Secret Garden, and I knew that wasn’t right. I know you don’t like the split timeline as much as I do, although it is getting to be a cliche. Is the group of artists authentic? The name doesn’t ring a bell. The Magenta Brotherhood is a fictional group – I had to look it up as I was reading, as it felt so convincing! I too struggled with all the different strands of narrative, and the back and forth structure. I think it made it choppy, and therefore more of an effort to read. Nevertheless, Kate Morton is an accomplished writer with a huge following and I have really enjoyed her previous novels. The story just didn’t flow very well and I thought it was too much effort for too little reward. I do like Kate Morton’s writing, though, so I’m sure I’ll still be tempted to read more of her books! Too bad it was that complicated. I’m finding that, lately, authors are putting every twist and turn into plots hoping for a breakout book. Editors must do their jobs better. Sometimes the simpler books are the best. I think Kate Morton is a good writer, but her books have too many layers that just aren’t necessary. I agree with your agent. Complexity in a novel is fine if it adds something to the story, but in a lot of the books I’ve been reading recently it seems as though multiple time periods, extra subplots and framing narratives have been added just for the sake of it. I like the idea of this, but I’m not sure it has enough about it to justify the length or the complexity. One for the ‘maybe someday’ list I think. I do think it’s worth reading, but it definitely could have been shorter and simpler without too much being lost. I do love puzzle novels, but I also want a sense of a need to solve the puzzle, not necessarily just a puzzle for a puzzle’s sake. That’s probably a fine line to walk. I also love a good archivist story/character, so even though I’ve never read a Kate Morton novel, this does sound like one, overall, that I’d enjoy! I do like Kate Morton’s writing – it’s just the way some of her books are structured that I struggle with – so I’m glad I haven’t put you off! I hovered with choosing this book, because I was so disappointed with the previous one I had read. I didn’t choose it in the end. I really wish authors did not complicate books and plotlines unnecessarily. It really does put me off when the book is far longer than it really needs to be. I was disappointed with my last Kate Morton too – The Distant Hours – and although I thought this one was better, I still wasn’t impressed. I like her writing and her ideas, but not the structure of her books. This was too disjointed and didn’t flow properly as a story. Yes, I found it confusing too. It was well written and interesting, but with too many separate storylines that felt disconnected from each other. I think The Forgotten Garden might have been a better introduction to Kate Morton for you. I too liked The Forgotten Garden but have not been tempted to read more by this author. The Forgotten Garden was a good one, but I’ve been disappointed with the others I’ve read since then. Maybe I’ll give her another chance, but I’m not in any hurry when there are so many other authors to read.